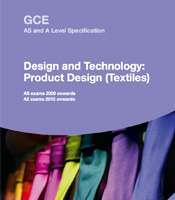 A-level Design and Technology: Product Design (Textiles) helps students take a broad view of Design and Technology. The specification also helps them develop their capacity to design and make products and appreciate the complex relations between design, materials, manufacture and marketing. This four-unit specification requires students to develop their ability to design and make a product (or in the case of AS, a number of smaller products) in both years of the course. There are two coursework units. Text 2 - Unit 2 is 50 per cent of AS and 25 per cent of A-level, Text 4 - Unit 4 is 25 per cent of A-level.